We all know this conversation. Kids categorize items, even without knowing they are doing so, to make sense of their world. Early on, that often looks like all animals are “doggy”, all people are “mommy”, and all toys are “ball”. Gábor Győri states that, “Categorization is the most basic cognitive process. It is the ordering of phenomena according to similarity with the purpose of guiding our interaction with the environment.” (Basic Level Categories and Meaning in Language, 2013) Categories help us to generalize experiences and bring sense into our ever changing environment. Additionally, “Categorization also facilitates the storage and retrieval of information, and it supplies a principle of organization by which new information can be banked efficiently in memory.” (Bornstein, Arterberry, 2010). It gives us a way to describe an item to others. It provides connections between ideas for similarities/differences. It gives us a way to group our thoughts. It provides AAC users the tools they need to find vocabulary. 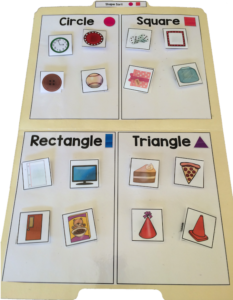 If you are working with elementary aged students, keep in mind that exploring word relationships and sorting into categories is a CCSS standard for Kindergarten (CCSS.ELA-Literacy.L.K.5). Sort. Many preschool activities involve sorting. Sort by color; sort by size; sort by shape. These activities are often very hands on and fun. Read books. Katherine Stout (2000) recommends reading books with children that have already classified items. This board book provides a fun way to help children learn colors. Start a collection. I really like this article’s idea to collect items with the child. Collect things that are a certain color, shape, function and keep them displayed. Add to the collection periodically or make new ones. Another idea for categorization practice? My newest creation, “Sort by 4s!” You can get it here. 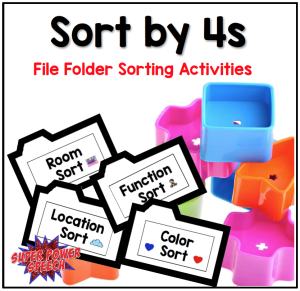 I am confident that having these sorting activities will be a perfect companion to your other category activities and one that you can use for years to come! Purchase your copy here. 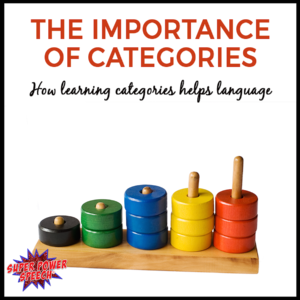 Looking for higher level products to work on categories with AAC users? Check out Simple Sentences-Books for Early Language, made especially for LAMP users! Tell me in the comments below, what is your favorite way to work on categories? My toddler calls every color yellow. But it’s more a question. She knows it’s not yellow, but is still learning the word color. She lives to repeat the correct color after I answer her. For younger students, I love using Playmobil toys, distributing supplies to different school staff (gym, cafeteria, library, etc. ), “shopping” at pretend stores, and pretending to pack for different types of vacations (ski holiday, beach, etc.). For older students, I like to use simple history or science projects. For example, my fourth and fifth graders recently made homemade flashlights. They sorted the flashlight parts in a variety of different ways including function (the batteries, the wires, and the alligator clips conduct the electricity), material (cardboard, metal, glass, etc. ), and texture (sticky duct tape and electrical tape; smooth wires, light bulbs, and batteries, etc.). Please don’t forget about categorization of groups- animals, clothes (winter clothes, summer clothes), foods (spicy, candy, fruits, vegetables), drinks (hot drinks, cold drinks), toys, function, appliances, furniture, etc. and even more specific- types of animals, common characteristics (ones with fur, ones with feathers, scales), kinds of trees, flowers, etc. The possibilities are endless and the vocabulary can be more specific and rich, beyond colors, shapes, and numbers.